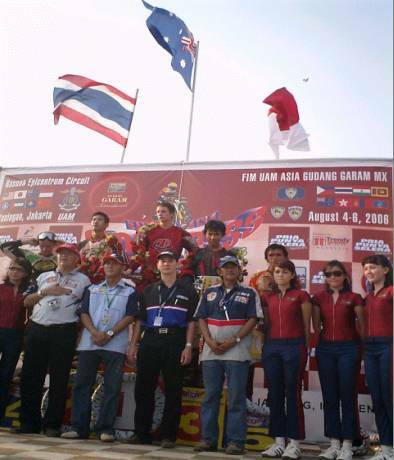 Round 3 of the 2006 AMSC was hosted by 2005 Best Event Award winner Helmy Sungkar at the 1.25 Km Rasuna Epicentrum Circuit on August 6th surrounded by spectacular Jakarta high rise buildings in the very heart of the Indonesian Capital. Visiting Riders from 9 different Countries attended Round 3, however injuries curtailed the arrival of India and UAE entries, but with the upsurge of quality Riders in the host Country, the 125cc category boasted a full gate with 2 reserves while the 85cc category fielded an entry of fourteen 12- u15yo youngsters. Weather for the entire 3-day schedule was dry and hot, putting pressure on the organisers track watering facilities, however with the later addition of stand by tankers the situation was controllable. 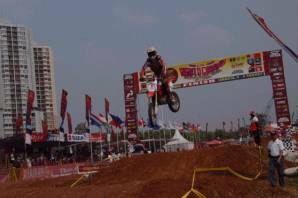 Unfortunately during Friday practice, Aep Dadang fell and for some time there was some doubt that the Indonesian Champion would compete, however with rest and credit to his own determination he did qualify and race. Saturday Qualifying - 85cc. 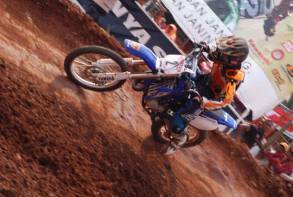 Arunkrung PinPon - Thailand, No 1, Honda, 1:19.048 / Alex Wiguna - Indonesia, No 2, Yamaha, 1:21.422 / Bobby Aditya - Indonesia, No 23, Kawasaki, 1:25.330. Sunday 11:45am, Moto 1, 125cc - A first turn mêlée resulted when Robinson went down midpack in front of Mackie and Philippines Glen Aguilar but Hannu Malherbe No 40, Turbo, Sean Hewett No 19, and Zulfikar No 45 were clear and out in front. 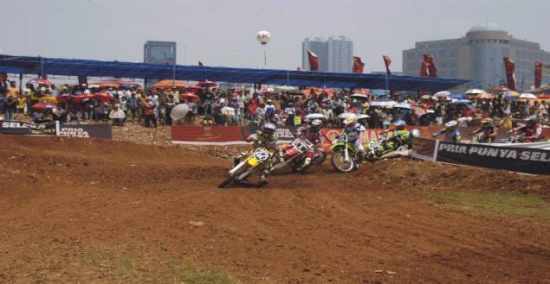 As they completed the second lap of the 20min plus 2 lap race, Turbo retained his lead over 17yo Indonesian Malherbe and Zulfikar then followed Denny Orlando and Dadang who had taken a wider line and missed the first corner chaos, then followed Cody Mackie making up ground in sixth place. Another 4 laps and the hard charging 19yo Aussie passed Hannu’s yellow Yamaha into second place but Turbo was still 9 secs in front with approx 2/3-race distance to go. Mackie whittled away at the Thai Champs lead and by the 17th lap was right on him and then the unbelievable happened - Turbo fell! The disappointment from the spectators! Next lap he fell again - in the same place, and Cody Mackie cruised to the chequered flag with Indonesians Denny Orlando and Aep Dadang taking 2nd and 3rd respectively. 1:50pm Moto 1, 85cc - Thailand’s Arunkrung Pinpon led from start to finish and try as he may, Indonesia’s Alex Wiguna just could not catch him. A strong performer was another Indonesian Rider Bobby Aditya and for the first part of the 10min +2lap race Jan Carlo Rellosa of the Philippines sat in 4th place in his first ever event in Indonesia before being passed by Irvan Hermawan of Indonesia however by race end this was reversed again with Pinpon taking the chequered flag 14.9 secs ahead of Wiguna with Aditya rounding out the top 3. Helmy Sungkar’s organization was superb with the leading 3 Riders National flags raised behind them and Thai National Anthem played for the winner. 4:00pm Moto 2, 125cc - Mackie finished Moto 2 as he started - in front! Kiwi Robinson held 2nd place for 2 laps however lap3 positions reverted to Cody, Turbo, Hannu, Glen then James. Aep fell, giving more pain to his aching body and Robinson re passed Aguilar, other wise the leading four retained the same position to the finish except the time differences. Mackie 12.9 secs ahead of Turbo, the very talented Malherbe only 5 secs behind him, Robinson a further 10 secs in arrears and Denny Orlando another 7 secs rounding out the top 5. Another Sungkar innovation after the podium ceremony was the following press conference in Air Con Marquee with facilities for media and Riders, leading to a very professional presentation indeed. The Asian Series is a keenly contested Continental Championship, however the Competitor camaraderie is unique. Pleasing sights were that of Aussie Cody Mackie giving his Indonesian mechanic Mamat an appreciative hug for his work on the KX250F. And what a joy to see the boyish delight of young Hannu after his brilliant 3rd place in Moto2. Apart from Rider effort, one of the hardest working members of the Thai team is Nuntaphat Bunyarataphan (Tui). 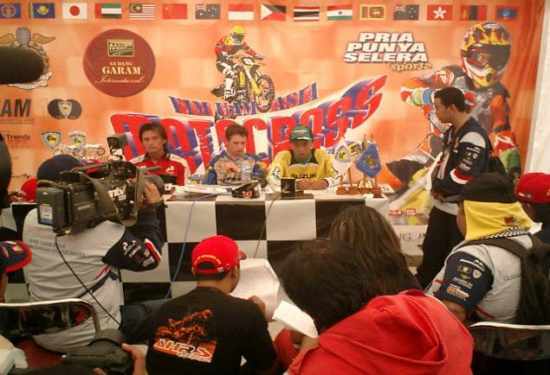 At each press conference he has to speak for both of his non-English speaking Championship Riders plus the added task at Jakarta of caring for the younger Pinpon brother who rode a support class having been out of the AMSC 85cc age grouping.